The five Buddhas symbolize the five basic personalities of the human experience that Buddha transformed into positive traits during his journey to enlightenment. Those walking the path to enlightenment can study Buddha's experiences along their own journey to transformation. Originally there was just one Buddha, the Adi-Buddha, also called the Primordial Buddha. Within this Buddha resided both sexes of female (bell) and the male (thunderbolt). Eventually, the two sexes in the Adi-Buddha were given independent life as yin and yang expressions of the one truth-creation. In order to achieve enlightenment, Buddhism wisdom states you must go through an inner transformation. This path to enlightenment is paved with all of the negative behaviors that imprison you and keep you from spiritual evolution. These negative behaviors constantly feed your delusions about life and hide the truth from you. In order to get to the truth, you must journey deep within yourself to shatter these false beliefs and behavioral habits. 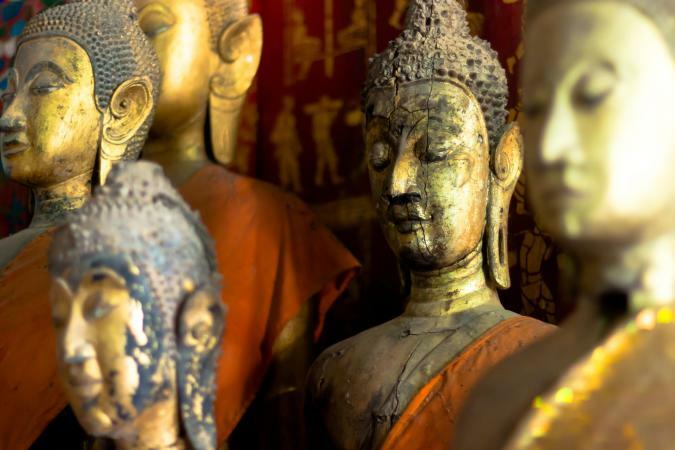 Buddhism refers to these five emotions as the five human failings. This is because of the negative impact they have on your life and how they can make your spiritual growth stagnant. When you move through these emotions and conquer them, you'll be free to transcend them to a higher spiritual awareness. The five Buddhas represent the transformation of these five human falsehoods. Buddhists strive to transform what were once five negative traits into positive aspects of their human character. These five Buddhas go by the names Dhyani (meditation or contemplation) Buddhas or Wisdom Buddhas. Aesthetics play a big role in the transformation of negative emotions. Many use color as an emotional expression. In many instances, colors can alter or change completely by the effects of color. Recall a time when you painted a room a different color and the emotional reaction the new color evoked in you and visitors. Science has proven the ability for color to elicit emotional reactions and responses. Many people select the color of their daily wardrobe based on how they feel that day. Phrases such as "feeling blue" or "in the pink" is a good demonstration of the emotional correlation to color. Each of the five Buddhas represents the negative side of a personality trait. Buddhists consider this negative a weakness. The goal is to transform each negative into a wisdom. The only way to achieve this transformation is to recognize the weakness. Each of the five Buddhas has many aspects assigned to it, including a direction, a color, and an element. The purpose of dividing the Buddha into five distinct personalities with flaws is to demonstrate that you shouldn't deny or suppress a weakness. Instead, you should invest in the spiritual growth it requires to understand the true nature of your weaknesses. This means you must peel away the layers of misleading deceptions until you reveal the truth and it can then become part of your overall wisdom and understanding. This is the process of transformation. The power of the unknown delusion is uncloaked, examined and transformed by enlightenment. The Akshobhya Buddha personality exemplifies anger, which breeds hatred. The transformation of this Buddha is said to be like holding up a mirror so you can finally see this negative emotion. The wisdom of the mirror is that the reflection is non-judgmental.It simply reflects the truth as it is without any kind of emotional embellishments. You may know this kind of truth as the naked truth, meaning your bare it for all to see. The color blue represents the water reflecting the true nature of the sky. The Vairochana Buddha symbolizes the human weaknesses that ignorance creates. Ignorant people believe they are smart and know everything. Ignorance simplified means unknowing. It's through meditation and inner soul searching for truths, that you first begin to realize how little you know and that the more you learn, the less you know. Buddhists refer to this as the evolution of the Dharmadatu Wisdom. The dramatization of this stage of learning in the life of the Buddha is the first time he preached to his followers in the fabled Deer Park. The symbolic Buddha depictions in sculptures and paintings is that of the Teaching Buddha with the symbol of the sun or solar wheel that sheds light upon the ignorance of humankind. Desire creates lust. These are two of life's most delusional emotions. When you transform these two negative emotions, the result is love and compassion or the Amitabha Buddha. Once transformed into positive feelings, these two meld together to create discriminating wisdom. All-accomplishing wisdom is the transformation of jealousy or envy. If you ever wondered where the phrase, "green with envy" came from, this is it. The negative emotion of fear always accompanies, but you can transform this emotion into fearlessness. Transformation of jealousy brings contentment with self and others. Once transformed, green becomes the color of peace, tranquility and the healing properties of nature. 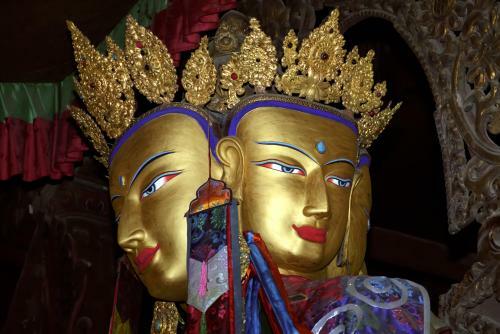 The negative emotion associated with Ratnasambhava Buddha is pride. Coupled with this emotion is greed. Through enlightenment, the transformation of these negative aspects become wisdom of equality or sameness. This realization brings a deeper understanding that no person is better than the next and everyone is a true equal. The transformation allows you to see how all people are alike. You recognize that everyone has the same desires, hopes and dreams. As you can see, it's quite a journey to find enlightenment and transformation of the negative aspects of the human condition into the positive five Buddhas.